The Advanced Diploma of Screen and Media focusing on Film and Television provides in-depth knowledge of the filmmaking production process and related screen and media practices. Students engage in the process of conceptualisation, technical production and final delivery on a number of projects including short film, music video, documentary and alternative screen media. This hands-on curriculum is designed to reflect real-world industry environments and employability skillsets while encouraging students to explore their own creativity and passions. 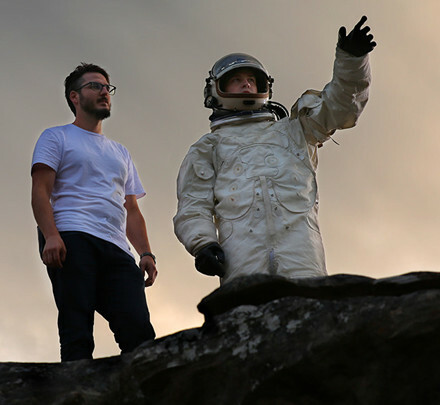 Matt Wilson and Brett Tinning (pictured) are shooting amazing music videos, such as the interstellar video for Melbourne band, Forest Falls. Both Matt and Brett graduated from the Advanced Diploma of Screen and Media before completing the Bachelor of Film and Television. Check out this showreel to see projects by our screen and media students specialising in film and television. The course offers students a range of creative and technical skills in film and television production. The Advanced Diploma of Screen and Media – Film and Television provides students with an inspired approach to the development and creation of film and television content for the screen and media industries with an emphasis on conceptual, creative and technical production techniques and processes. Major study areas focus on producing, production planning, art direction, advanced cinematography, editing, post-production and visual effects, colour grading, scriptwriting, development and interpretation, directing cast and crew. Students at this level will be able to develop productions independently, collaborate with others, focus on a chosen area of interest and manage projects from conception to completion. The course is designed to equip students with a combination of practical skills, critical thinking skills and cultural and work ready attributes to prepare them for a career in the screen and media industries. Year 12 applicants will typically apply for the Diploma of Screen and Media - Film and Television, structured to provide students with basic knowledge of film and television production, and then progress to the Advanced Diploma, designed to further develop and refine one's knowledge and skills in the following key areas: cinematography; producing and production planning; editing and post-production; script writing and development; directing. Students must complete the three core and 13 elective units listed. The Advanced Diploma of Screen and Media - Film and Television is designed to equip students with knowledge and skills necessary for working in film and television industry. Graduates may forge a career either independently or with a production house or television channel, in the film and television industry, as a producer, production manager, scriptwriter, camera assistant, director of photography, lighting assistant, editor or visual effects artist. The Advanced Diploma of Screen and Media - Film and Television aims to provide students with high level skills in pre-production, post-production, cinematography and lighting, directing, scriptwriting and script editing. Course content and projects are designed to allow conceptual and technical autonomy and to encourage creative thinking, innovation and collaborative work practices anchored in broad cultural contexts. Projects are conceived and designed to emulate industry practices with a focus on communication skills, use of technology, team work, deadlines, industry standards and regulations, whilst developing engaging creative content. Indicative nominal course hours: 970. Successful completion of relevant diploma level qualification. Applicants with relevant industry experience are also eligible to apply. Applicants are required to submit a portfolio of their work along with the application for this course. Portfolios must be presented at an on-campus presentation session.